I suppose I’m a bit like most people I can’t keep up with what’s going on in the world, so I welcomed it when Richard Millet posted on the comparison between the Dunkirk flotilla and some ships going to Gaza. I think that the Palestinians should receive as much aid is possible. I can’t imagine what it must be like to be under the iron fist of Hamas. I think Palestinians should get all the aid they can take, but realistically most of it will be siphoned off by Hamas and it won’t go to the most needy, rather it will be used to bolster their regime by buying favours. I was therefore very alarmed when I read a link to the Viva Palestina site. Palestine Our Route, Humanitarian Aid Our Load Flotilla, which consists of 9 ships, carrying 750 passengers in total including 35 MPs, numerous press members, artists, intellectuals, writers, representatives from NGOs, activists, women and children and 15,000 tons of humanitarian aid cargo. On the other hand, millions of people around the world have been watching this flotilla in their own countries, as supporters. These ships are carrying onboard the common conscience of people of the world, prayers and wishes in all languages, playgrounds for children, medical aid supplies for the injured and the sick, construction materials for building back the schools for the children and homes of thousands who currently live in tents or in ruins. The cargo of the ships has been checked and approved by independent international organizations; the ships are certainly carrying nothing else but humanitarian aid. Israel claims that they are helping Gaza. We know that Israel only allows clothing items sold by Israeli dealers and has given nominal permissions to a few sick and injured people out of Gaza. However, basic needs of Palestinians are completely different both in terms of quality and quantity. This fact has been openly stated in numerous reports by international organizations. Aid cargo on these ships include power units to be used in order to maintain access to clean water, construction materials for building homes, children’s playgrounds as means of psychosocial rehabilitation for the children of Gaza, tools and equipments to restore the downed sewerage system of Gaza which now threatens the public health… etc. Moreover, Israel claims that they are allowing all of the NGOs attempting to bring humanitarian aid into Gaza. It is proven by documents that this is a lie. Also the application filed by IHH received no response. This fact stated here is again based on official documents. On the other hand, UNRWA has declared that the aid cargo carried by the flotilla is very important for Gaza and much needed by the people of Palestine, stating that they hope this rightful and needed flotilla would not become subject to illegal obstructions by Israel. Meanwhile, Israeli high officials have been making strangely intense statements through which the state of panic they are currently can be sensed in regards to the flotilla. They are spreading out various claims in order to deliberately create a stressful atmosphere. 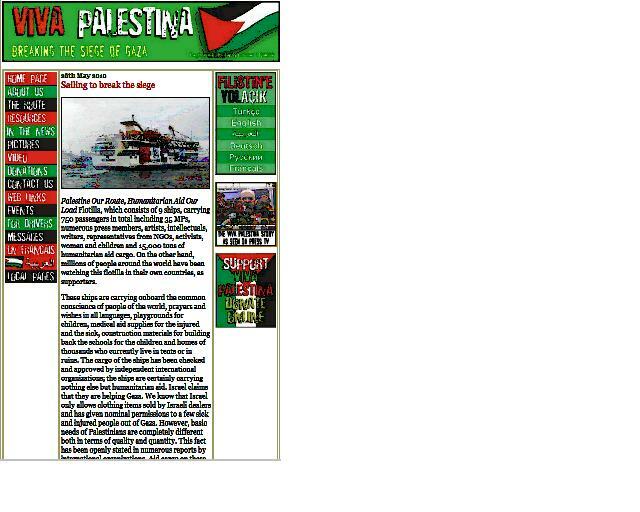 They claim that the flotilla has a political agenda other than its stated aim and Israel says that they will attack the ships, arrest the passengers…etc. These statements aim at intimidating, preventing and dissuading the participants of the flotilla. Israel again tends to stop the attempts of breaking the embargo which is a collective punishment to the people of Palestine in Gaza in a completely illegal way in international terms. However, Israel still has not been able to clean up the shame caused by arresting the activists in the previous flotilla and ramming the ships. Current Israeli government causes itself to become isolated by declaring everyone as its enemy. In fact, it is isolating the Jewish people by doing so. It has turned Gaza into a prisoner camp and has been carrying out a genocide. This camp and genocidal acts very much resemble Hitler’s actions in history. It is an important duty for all the Jews, especially the Jews from Turkey living in Israel. We are calling out to them and to all people of Israel to stand for justice. We would like them to also know that Jewish people that live in Israel will become totally isolated from the rest of the world thanks to these Israeli policies. Because Israel waged a war against peace and humanity. Soon, they may face great difficulties and embargo because of this reason. If, one day, they turn into an embargo-stricken nation in need of humanitarian aid, everybody in this flotilla campaign will again work with the same degree of determination and passion to break the embargo that will be imposed on them. The statements and the attitude of Israeli officials should be seen an attitude against peace. Their reaction does not comply with the requirements of logic and humanity. As long as people of Israel remain silent, they will be supporting these invasive and inhumane policies which are completely against international laws. As a matter of fact, this attitude ignited serious debates among Israeli public. The most necessary and right thing Israel will do is to allow these ships into Gaza. It is important to underline the fact that this flotilla has got a humanitarian agenda only. This flotilla gathered its support from the people of the world and it is the voice of the common conscience of all humankind. Its legitimacy comes from the international laws and the conscience of all humankind. It is obviously and indisputably a legitimate act. The people of the world are now taking a stance against the occupation, attacks and the embargo carried out by Israel which are more dangerous than nuclear weapons for humankind and the future generations. People are now making their voices heard and forcing their governments to care for the oppressed and the poor, for the world peace and for their own future. This is why the flotilla will ruin a lot of bad games. This campaign has been completely organized by NGOs and these are all independent organizations. The only place they depend on is the hearts of those good people. Israel claims that this is a campaign to support Hamas. We need to make it clear that none of those organizations is the addressee of this campaign, whether it be Hamas, PLO or any other leftist organizations. Our only addressee is the people of Palestine. This embargo is a crime against humanity and a shameful thing. It has been happening in our lifetime. Today, we are the ones responsible to the future generations as the witnesses of this inhumane embargo and we will carry out all these humanitarian efforts to fulfill that responsibility. We believe that there is enough space for everyone in this world and we can all live together peacefully in this world. The racism and implied threats in the highlighted text should be obvious to any thinking adult. 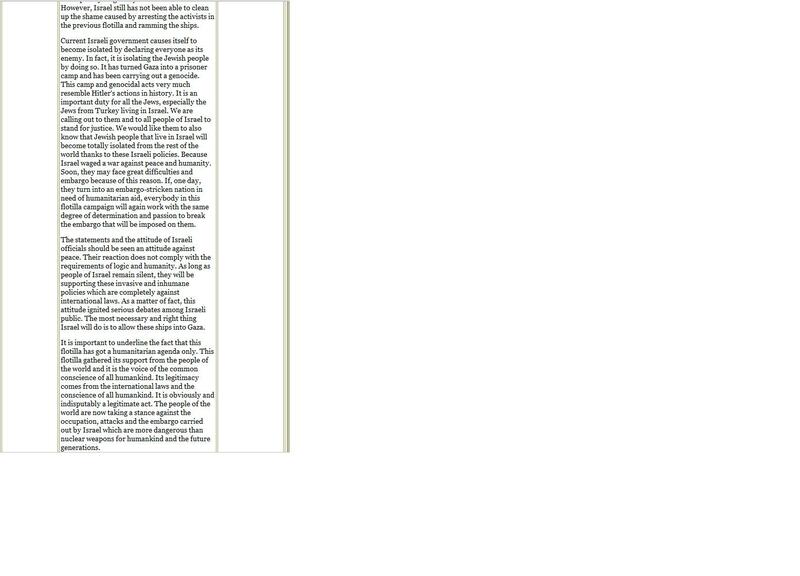 Apparently it was removed sometime after I commented on its nauseating content on Richard Millett’s blog. Viva Palestina is a British based charity and they should be much more careful when they publish such comments. The cause of the Palestinians has already been associated with far too much racism, it doesn’t need any more. By chance I ran across a strange blog, which on the surface looks fairly innocuous, simply a pro-Palestinian website. But when you dig a bit deeper, you find that they print any old racist rubbish including the work of the well known anti-Jewish racist, Gilad Atzmon. WILL IJAN CHALLENGE JEWISH POWER? Amazing new Video Exposing Zionist Supremacism! DON’T LET ZIONIST-FIRETERS TAKE OVER,DESTROY TEA PARTY MOVEMENT ! I assume that this design company registered it on behalf of a client, but who knows? I am not sure if these domains and businesses know that their shared IP address hosts such blatant anti-Jewish racism. Clearly, boycott-israel.co.uk and watchwhatyoueat.org are linked, I wonder what is their connection to http://www.shoah.org.uk ? I can only assume that www.shoah.org.uk belongs to some semi-literate neo-Nazi given the varied nature of the racist posts there, but we’ll see. I often wonder when I see supposed critics of Israel using the banner of “Anti-Zionism”, what are the other peculiar views that they hold. To me, it seems that many of these “Anti-Zionists” are not what they seem. By that I mean that their animosity towards Israelis is only part of some deeper prejudice or hangup. An example, would be Alan Hart, onetime BBC journalist and now doyen of “Anti-Zionist” circles. Alan Hart has been a vociferous critic of all things Israeli, but he has been careful to say that is not really against Jews. Hart is quick to trot out the old “some of my best friends are….” defence. Which is all well and good, except when you scratch beneath the surface and ask him about 9/11. Astute readers will already know what his answer is….read more at Adam Holland. Update 1: I forget that Dr. Stephen Sizer seem to have a high regard for Alan Hart’s views. Salman Rushdie has said, ‘When people are told that they cannot freely re-examine the stories of themselves, and the stories within which they live, then tyranny is not very far away’. Forty nine years ago, this week, Peter Benenson struck a blow against tyranny by announcing the formation of a new organization to support forgotten prisoners who were jailed solely for their beliefs. This week, Amnesty International launches its Annual Report and starts year long preparations for a jamboree titled Amnesty@50. From a small group of activists it has grown into a gigantic, global organization. And in many ways, has come to resemble the forces that it has done so much to oppose. Its record of handling one of the greatest challenges to its reputation suggests that it is entirely unable to examine the story of itself or the story of its times. So difficult is it for Amnesty International to provide a coherent account of what has happened over the last few months, that it has chosen to provide no account at all. In his reports to the International Executive Committee circulated for ‘transparency’, the Interim Secretary General Claudio Cordone, has airbrushed out any mention of the concerns that I forced Amnesty International to face when I went public with my complaint that the organisation has sanitized the reputation of Moazzam Begg, a former Guanatamo detainee. They have treated him as a human rights advocate, although he champions Anwar al Awlaki and al Timmimi. Like all tryrants – whether of the right and left, Amnesty International raised the spectre of an assault on human rights to avoid answering questions and to imply that Amnesty International was under attack. This helped shut down internal debate or demands for accountability from its own staff. At first the managers suggested that Begg only expressed his experiences of detention; and that they did not promote his views (suggesting that his views fell somewhat short of a belief in the universality of rights). Soon, they claimed that his views were indeed universalist but that he supported ‘defensive jihad.’ – which is, after all waged to establish systematic discrimination. Amnesty International felt that this view was not ‘antithetical to human rights. Although he published in a Muslim Brotherhood journal and has associated with the Jamaat I Islami the senior leadership decided to endorse him as a human rights advocate, which they had refrained from doing before the crisis. But at the AIUK AGM, Begg was not mentioned in reports of a European tour to advocate for the release of the remaining Guantanamo Bay detainees. Where they had previously had a picture of Begg at the door of Downing St with Kate Allen, this picture was dropped from the power point. No wonder, Amnesty is in a fix. They do not know whether they are valorizing Begg or dropping him. I met Begg recently and told him that I thought that he had been true to his beliefs but that Amnesty had not been true to theirs. Nor has Amnesty International acknowledged their debt to Cageprisoners or the extent of their relationship with the organization. I intend to do the work that for them. Whatever my views on Begg or Cageprisoners, I do not think that a collective corporate amnesia is the right approach to take when finding a way forward. Now they have announced an internal independent Review to discuss criteria for partnership. The reviewers have said that they are not investigating allegations against Begg, but only looking at procedures that were followed and to suggest criteria, in order that the organization can manage its reputational risk. Nor will they examine all available evidence, only any new evidence that might come to light. The problem is that no-one knows what evidence was examined, but there was plenty that was ignored. Senior experts well known to Amnesty International were not consulted, even though at least one wrote to the Secretary General offering to give evidence at the time I was suspended. Could it be that the leadership would rather that their research and analysis looked shoddy and incompetent than admit I was right? Most western human rights and civil liberties organizations have watched the unfolding crisis in a frozen and complicit silence. They say nothing because they too have committed similar errors of judgement, supporting proponents of radical Islam rather than simply defending their rights. Too often in Britain, entirely legitimate concerns about racism and the marginalization of Muslims are allied to the promotion of groups associated with the Jamaat I Islami and Muslim Brotherhood. Their programmes of social control such as promotion of the hijab are supported quite uncritically. The actions of human rights advocates mirror those of governments from Chechnya to the UK. Recruit former insurgents or fundamentalists and subcontract them to provide surveillance and control over the mass of the population. Defeat one form of fundamentalism by supporting another. Human rights groups have entirely ignored this story and as a result simply cannot tell the story of the times within which we live. There is a void, where there should be analysis of the organizational forms and ideological links of western Islamists. There is silence on ‘faith based initiatives as part of soft ‘counter-terrorism’ strategies. They cannot accuse governments without accusing themselves. Even internal dissent is met with expulsion as Marieme Helie Lucas, the Algerian founder of Women Living Under Muslim Laws, has recently explained. And that raises the question as to whether there is a long term determined programme of support within human rights organizations for the political programme of Islamists. Those who make this allegation are immediately accused of supporting torture or arbitrary detention. Shadi Sadr, the courageous Iranian lawyer who has been sentenced in absentia to lashings and imprisonment, has pointed out that while Human Rights Watch and Amnesty International have rushed to condemn the niqab ban in Europe, not a word has been heard against increasing dress code restrictions imposed by the State in Iran and accompanied by draconian punishments. But it is the bland justification that Amnesty works with everybody including the Catholic Church which has seemed distinctly unwise. I expect that the Church might object to being put in the same category as supporters of Salafi Jihadi politics. In any case, Amnesty should have spoken out against the complicity, cover up and abuse of children by those exercising religious authority. In the event, they stayed shamefully silent. As one voice, the leaders stood with the Catholic establishment and ignored Catholic victims. As Amnesty trundles towards its 50th anniversary, I will be working with others to ensure that whether Amnesty is covering up or cleaning up, whether the review provides any answers, the hidden history of human rights will be put on record. Peter Benenson said that we work in Amnesty against oblivion. If human rights organizations can no longer tell their own stories, others will do it for them. Gita Sahgal is a former Head of the Gender Unit at Amnesty International. She left Amnesty International on April 9th 2010 due to ‘irreconcilable differences’. You can read her statement on leaving Amnesty International here. Algeria: Union Headquarters Shut Down. “On 12 May 2010, Algerian authorities effectively shut down La Maison des Syndicats (2 Rue El Oued, Bach Djarrah, Algiers), the headquarters of an important coalition of independent labor unions fighting for workers rights, including the Syndicat National Autonome des Personnels de l’Administration Publique (SNAPAP). Their website has also been shut down. There’s a lot going on in Algeria that we hear very little of from the mainstream media, but thanks to the search function on LabourStart you can view all posts concerning that or any other country. But it is not only that, crime follows in their way. As skinhead criminals whose hobby is being neo-Nazis on the side become active within Arizona.